Have you ever wanted to play your favourite game on a video billboard? Well here is your chance to play the classics like you never have before. 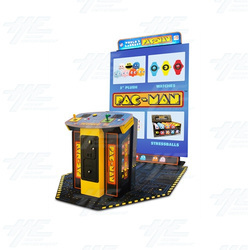 BANDAI NAMCO and Raw Thrills have teamed up to light up your room with the World’s Largest PAC-MAN. The World’s Largest PAC-MAN, showcased at 2016 IAAPA Attractions Expo in Orlando, Florida in November, allows you to play the classic hit PAC-MAN on a billboard-sized, 108 inch screen. One or two gamers can play the World’s Largest PAC-MAN. The gameplay has been updated with 2-player simultaneous play, allowing players to cooperate to complete the PAC-MAN mazes. Another feature of the World’s Largest PAC-MAN is that it now displays high scores. “Bragging” screens show which player earned more paints during the game. World's Largest PAC-MAN comes with a unique advertisement feature – “attract mode”. You can upload your own image or advertisement on the screen during attract mode. To use this feature, simply upload your advertisement files on to a USB flash drive and insert into the podium unit. The unit is fitted out with an attractive LED design as well as reliable dual joysticks and control buttons. If you die in the World’s Largest PAC-MAN you can coin up and continue the game so you can keep score with your friends.